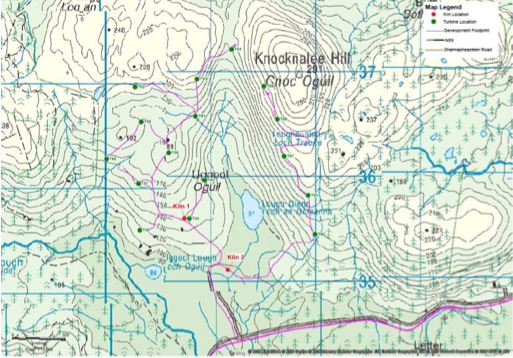 The south Cloosh access track located between Borrow Pits 3 and 4, and Muster Points 8 and 16 is locally known as ‘Sean Teacht Road’. The road is so called because of the existence of an old stone dwelling house that predates the coniferous forest. 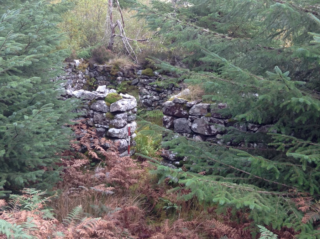 This structure is located at grid reference ING 509095, 732400, 40m South East of the Coillte access road. Though the dwelling is very close to the access road, as it is surrounded on all sides by forestry, it is not visible from the access road. The fact that the 150 year old house is out of sight may be the main reason why it is still today in such good condition. The perspective of the house must have been quite impressive before the surrounding lands were given over to forestry. 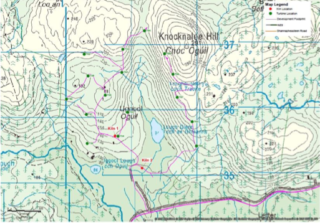 Located on top of an outcrop of rock, it must have seemed like almost an island in the surrounding bog. The first edition Ordnance Survey map shows nine structures, fields, and two kilns, all concentrated in one area with no apparent access road. The one remaining upstanding structure is hidden within the existing forest. The upstanding structure consists of a drystone-built rectangular house constructed in roughly coursed roughly dressed granite blocks between 8 and 13 courses high, or 1.8m high max. The building is orientated roughly E-W (long axis 35o) and measures 10.77m by 4.27m internally, with 0.8m thick wall. The building has two opposing entrances located slightly off-centre on the long axis. Two windows with splayed in-goings and intact lintels face south, the probable front of the building. There is no indication of a chimney, suggesting that the house was heated by a central hearth. The remains of garden walls to the rear of the house separate the structure from a steep drop where the bedrock outcrops. There are a number of large cut stones in no particular order on the forest floor close to the upstanding house, probably the remains of the other structures. 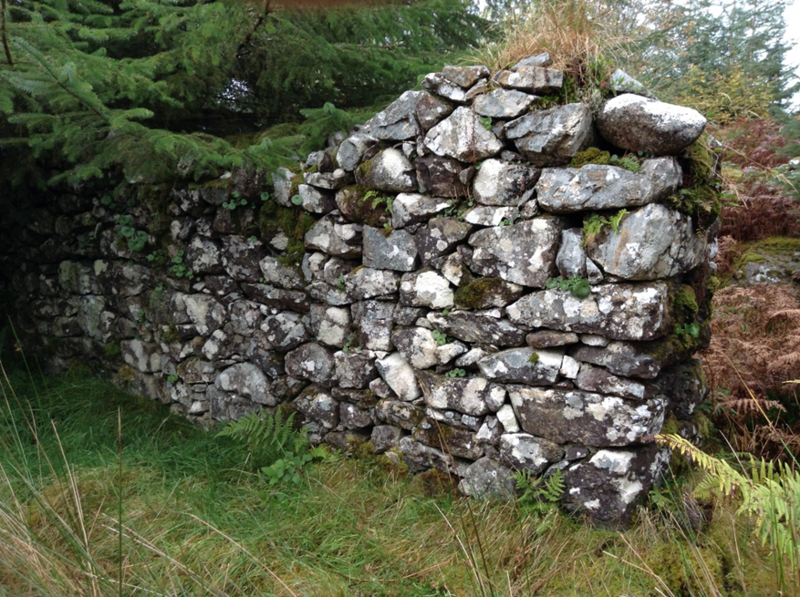 There are the remains of a number of stone walls to the east of the house. The settlement here appears to have been concentrated on an outcrop of bedrock and soil, surrounded by low-lying boggy ground. The kilns or the other remains are not readily visible in the heavy forest growth. The house and offices in Finnaun Td [Cloosh] was at the time of the Primary Valuation (c.1856) recorded as the home of a herd. A herd was a professional animal husbandman, sometimes working for himself, often employed by a landlord, who farmed cattle and sheep, often on marginal land, and most frequently in the west of Ireland. The occupier is named in the Primary Valuation as the Directors of the Law Life Assurance Co., and the land is held in fee, which suggests that the position of herd was vacant at the time of the Valuation. This was only one folio in the townland, making this house and its offices the centre of a property, 7,307 acres in extent. The Law Life Assurance Company or Society had been a creditor of the estate of the Martins of Ballinahinch, which included, the townland of Finnaun. As a substantial creditor the Law Life Assurance managed the liquidation of the Martins estate in the Encumbered Estate, taking over as new owners in c.1851. The Law Life Assurance Company owned the former Martins estate until 1872 when it was sold to Richard Berbridge. The Census of Ireland 1901 and 1911 show that the only family living in Finnaun were the Walsh family, headed by David Walsh in 1901, a herd. This suggests that the house and farm was occupied up to at least the early 20th century. The position as Herd must have been of high status as David Walsh’s children are referred to in both censuses as ‘herd’s son’ or ‘herd’s daughter’. The benefits of preserving the old stone house would far exceed the cost of carrying out the works described above. The uncovering of this hidden dwelling would allow local people to visit the house which is part of their built cultural heritage. The house has an interesting history and makes for a good story. The local media would most likely be very interested in publishing an article on this old house and the works that were carried by the GWP team to help preserve it. Coillte might be interested in helping to support the proposed works as it is on their lands and they have a national objective to increase biodiversity and to preserve cultural heritage within their Estates. Richard Griffith, ‘Valuation of Tenements, County of Galway Barony of Moycullen, Union of Galway’ in General Valuation of the Rateable Property in Ireland, Union of Galway, County of Galway. Acts 15 & 16 VIC., CAP. 63; 17 VIC., CAP. 8 (Dublin, 1856), p. 117. This page was added on 15/05/2017. Radio travelogue "Along Lough Corrib"
Scoil an Chlochair, Uachtar Ard.